The Performance Racing Industry trade show is one of the largest motorsports trade shows in the world. The Rosso Korsa brand has been around the block and they have a long, rich history in making competitive kart chassis. 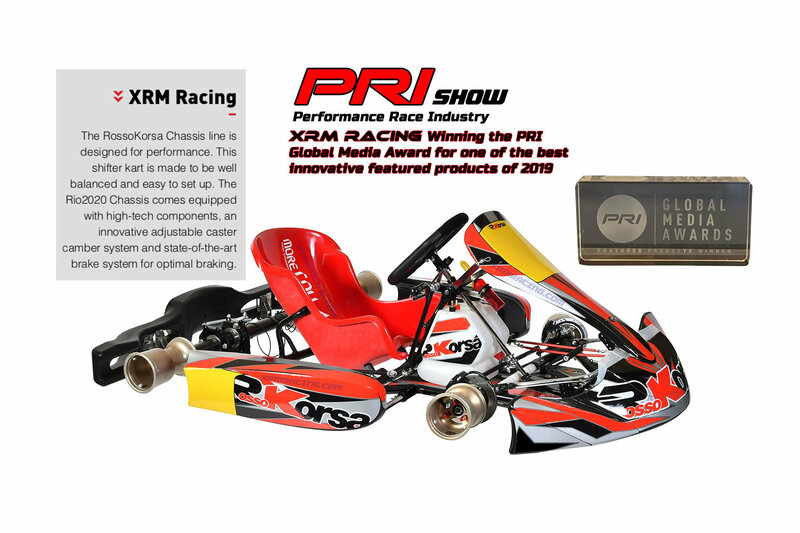 We at XRM RACING are the North American importer for Rosso Korsa and we knew we had an excellent product, because of that, we decided to exhibit these karts at the December 2018 PRI Trade Show in Indiana and won the Best Innovative Product for 2019 award. Not bad, beating over 500 products that were entered in the featured product show case. This chassis line not only looks Mean and fast, it actually is. Right out of the box, this chassis brand is all about performance and handling. After testing these karts, we were surprised how well-balanced and how easy the setup was. Just a few minor adjustments and the Rosso Korsa Rio2020 Chassis handled with ease through the corners, allowing me to maximize my exit speed to get a jump down the straights. I didn’t want to get out of the seat from testing, that’s how much fun I was having driving this chassis. We have been in the business of racing karts for over 40 years and we’ve tried a number of brands on the market. To say it was an incredible experience is an understatement. We are proud to be their North American Importer and they have so much to offer in karts of all categories. It will out perform the competition on any track. The Rosso Korsa Kart chassis comes equipped with high-tech components, innovative adjustable castor camber system, and state-of-the-art brake system that provides optimal braking. These kart chassis are easy to adapt to any driving style whether you are an amateur or a professional. No matter your style, this is the right product for you. Come check it out at www.xrmracing.com or call 480 336 3070 for information. Dealer inquiries welcome. Phoenix-area karting supplier adds new race seats and products brand. New website designed specifically with the Northern United States Rotax enthusiast in mind. Highlighted by 2009 F1 World Champion Jenson Button trying a shifter kart for the first time. Bell Helmets the official helmet of SKUSA in 2019. New Rotax program to host two national Rotax MAX events set for summer 2019.